Alexa changed its ranking system: I’m a winner! Alexa is an often criticised ranking of web sites, with the criticism largely based on the use of the Alexa toolbar as a source of data. 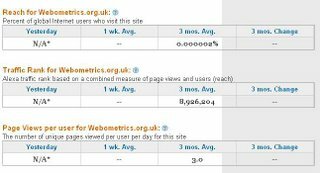 The use of the toolbar data skewed the ranking in favour of those sites visited by internet marketers and search engine optimisers, those who installed the toolbar, rather than the average user. Alexa’s big news, which everyone reported yesterday (e.g., Mashable, TechCrunch), is that they are now using additional data sources, although what they are is not very clear in their announcement. Obviously with any change in the ranking system there will be winners and losers, and those who win are less likely to complain than those who lose. Personally I think the new Alexa rankings are a HUGE step forward. This conclusion is based solely on the increase in my own personal ranking. 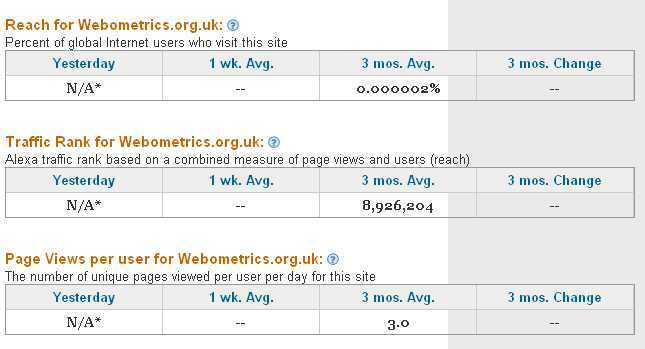 Back in January I noted that the Alexa ranking for Webometric Thoughts was 3,816,072. Today my Alexa ranking is 1,607,649 (1,389,032 for the 1 week average). Breaking into the top one million suddenly seems much easier. The gauntlet has been firmly thrown down by Oh, what a tangled web we weave…, , or has it merely been picked up after I threw it down previously? Unfortunately I have not had the opportunity to respond as my PhD thesis has been consuming my every waking moment, but I now have a couple of days respite. 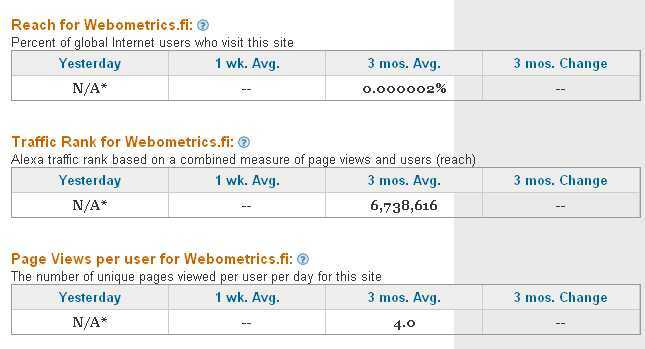 The blog readability test that showed my blog to be of a higher standard than the other webometric blogs at the end of November, now shows the Finnish webometrician to be of a higher standard. I will take the competition as an opportunity to up my game, but will Oh, what a tangleed web we weave… ? 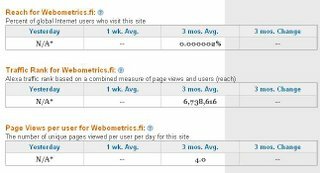 Despite knowing the meaninglessness of many the simple web metrics that can be calculated online and the inaccuracies that are inherent in the different tools available, for some reason I find that I am compelled to look at them. -Why does Blogpulse claim that I enthusiastically posted 16 posts on the 10th of September when looking at the blog I see I posted twice? -Why has Technorati failed to index my post on Facebook metrics whilst seemingly indexing every other post? -Who is the lone Alexa user who visited three of my pages? Unfortunately I lose this time, but it is still early days….and surely this is the smallest margin possible?